DUBLIN, OH – June 18, 2018 – Computerworld announced today that Infoverity is a 2018 Best Places to Work in IT winner for the third consecutive year – ranking #1 overall for Career Development, #2 overall for Retention, and #9 in its category (small), up from #12 last year. Infoverity is a global provider of Master Data Management (MDM), Product Information Management (PIM) strategy and implementation, Data Governance and Analytics, Managed Services and Hosting Solutions that help companies in the retail, consumer goods, manufacturing, financial and healthcare sectors to simplify their information and make it more useful to their businesses. Infoverity is featured in in the June 18, 2018 edition of Computerworld along with results from the 25th annual Best Places to Work in IT survey. Computerworld, published by IDG Enterprise, is the leading technology media brand that focuses on helping enterprise IT users and their managers to create business advantage by skillfully exploiting today’s abundantly powerful web, mobile, and desktop applications. Computerworld also offers guidance to IT managers tasked with optimizing client systems—and helps businesses revolutionize the customer and employee experience with new collaboration platforms. Computerworld’s award-winning website (www.computerworld.com), focused conference series, strategic marketing solutions and research forms the hub of the world’s largest (40+ edition) global IT media network and provides opportunities for IT vendors to engage this audience. Company information is available at www.idgenterprise.com. Founded in 2011, Infoverity is a leading global professional services organization focused on solving business problems caused by the proliferation and diversification of data in large enterprises. 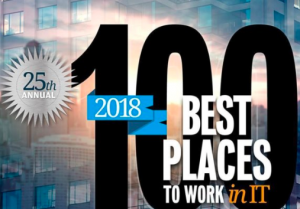 Infoverity is named among the Best Places to Work in IT by IDG’s Computerworld and by Columbus Business First. Infoverity provides Master Data Management (MDM), Product Information Management (PIM) strategy and implementation, data governance and analytics, managed services and hosting solutions that help clients in the retail, consumer goods, manufacturing, financial and healthcare sectors to simplify and maximize the value of their information. Infoverity’s global headquarters is in Dublin, Ohio, and additional service and support teams are located in Spain, Germany and Russia. For more information, please visit Infoverity.com and follow @Infoverity on Twitter.